Andy Nyman (Tevye), Kirsty MacLaren (Chava), Molly Osborne (Tzeitel), Shoshana Ezequiel (Shprintze), Harriet Bunton (Hodel), Sofia Bennett (Bielke) (Photo: Johan Persson). Darius Luke Thompson. (Photo: Johan Persson). 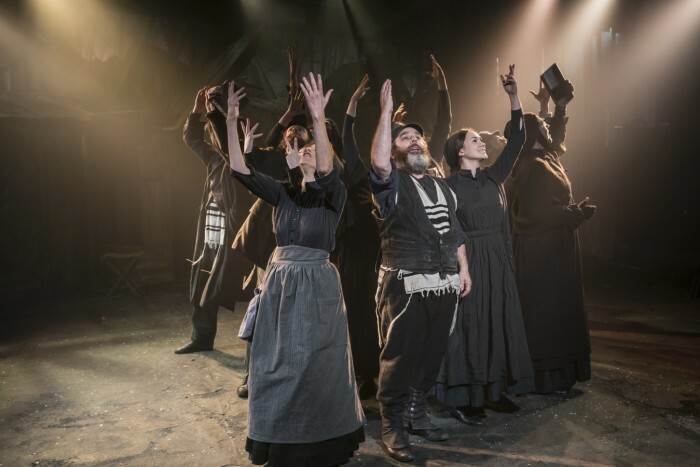 Kirsty MacLaren (Chava), Harriet Bunton (Hodel), Judy Kuhn (Golde), Andy Nyman (Tevye), Joshua Gannon (Motel), Stewart Clarke (Perchik), Sofia Bennett (Bielke), Shoshana Ezequiel (Shprintze). (Photo: Johan Persson). Hear me out: men dancing with bottles balancing on their heads. If nothing else, I think it’s worth seeing the show for this one scene. Jerome Robbins’ Tony Award-winning choreography is intact for this number, which is even more impressive in the small space. The original London production opened at Her Majesty’s Theatre, and there have been revivals at the Apollo Victoria Theatre and the London Palladium. I was intrigued to see how it would work in a smaller space, which is done exquisitely thanks to Trevor Nunn’s direction. 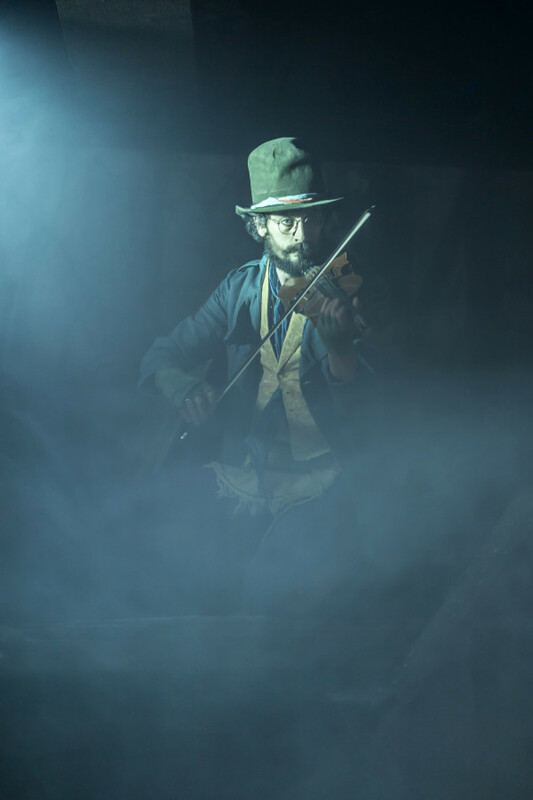 The small-town vibe of the Shtetl feels realistic in the space, and when Tevye turns away from the cast to speak to God or to think through his thoughts out loud, there is a real interaction with the audience. There is so much joy in Act I (particularly in the songs ‘To Life’ and ‘Miracle Of Miracles’) and I felt as an audience member that I was part of the celebration. 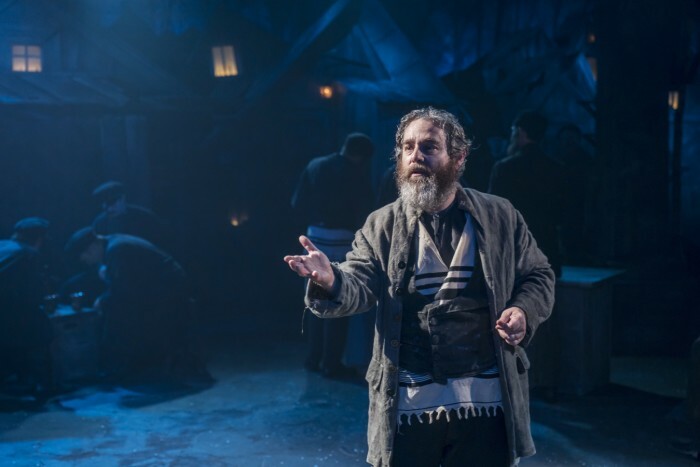 The intimate setting captures the heartbreak of some of the sadder scenes, when we watch Hodel leave her family and home, or watching Tevye and Chava’s relationship collapse. The company of Fiddler On The Roof. (Photo: Johan Persson). Although the plot of a Jewish milkman in Christian Russia marrying off his five daughters is quite specific to the time and place, the writing is funny and witty, and is still relevant. As the population of Anatevka is displaced, it’s hard not to think about issues which refugees still face in 2018. 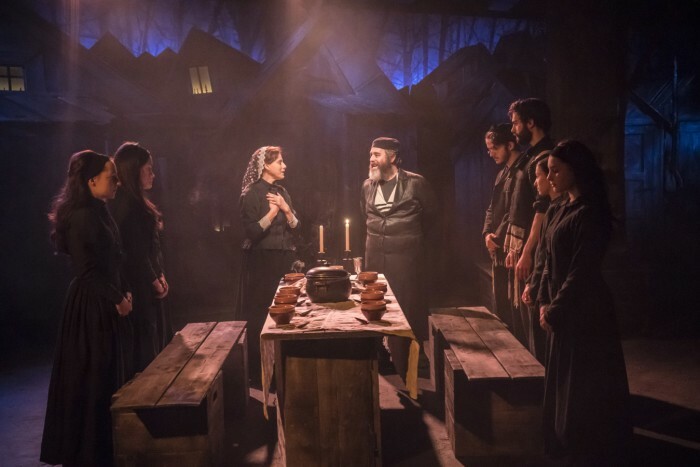 Fiddler On The Roof plays at the Menier until 9 March; visit the venue website for more information.